Plenty of international voice traffic and the high penetration of mobile communications (more than 152%) have led to favorable conditions for the launch of VoIP call business in Costa Rica. The market of Internet services is also quite developed here. But to obtain high profits, it is important to minimize the business costs on connecting to the Global Network. Let's see how much it costs to connect to high-speed Internet in Costa Rica. 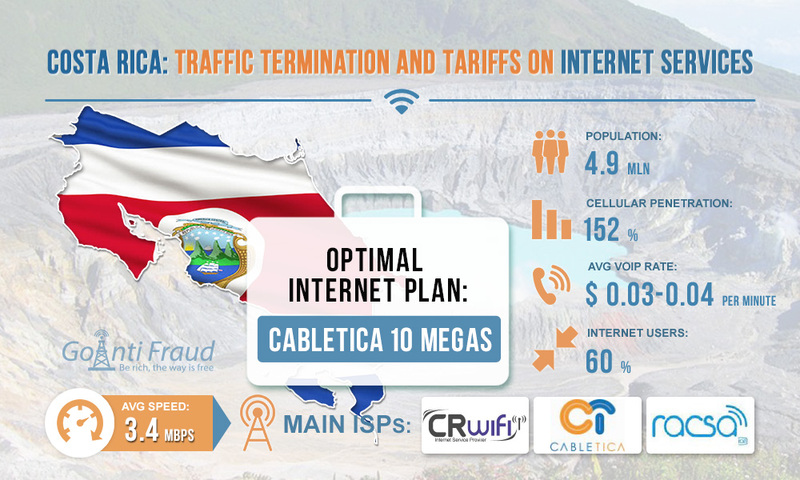 In Costa Rica, the broadband access market is considered the most developed in the region. At the same time, it covers the territory unevenly, and Costa Rica is on the list of 40 countries with the lowest Internet speed, which is 3.4 Mbps on average. High-speed and stable Internet is available mainly in the Central Valley area. Basic. $45 per month, download speed - 1 Mbps. Standart. $60 per month, download speed - 2 Mbps. Plus. $90 per month, download speed - 3 Mbps. Advanced. $125 per month, download speed - 4 Mbps. Premium. $220 per month, download speed - 6 Mbps. In order to have a VoIP GSM gateway operating smoothly, 42 Kbps per channel is required. The Standard package for $ 60 per month is quite suitable for the equipment that has a few channels in one location. However, the connection will cost another $150. 3 Megas. 26 dollars a month. 5 Megas. 29 dollars a month. 8 Megas. 36 dollars a month. 10 Megas. 45 dollars a month. 15 Megas. 67 dollars a month. 20 Megas. 68 dollars a month. 35 Megas. 96 dollars a month. 50 Megas. 105 dollars a month. 100 Megas. 150 dollars a month. The optimum Internet plan from Cabletica is 10 Megas for $45 per month and up to 10 Mbps download speed. If you have a lot of multi-channel equipment in one location, it makes sense to connect more expensive packages with a higher speed. Tariffs for Internet services from this provider are quite democratic, with the connection included in the price.